From the Curio Collection, by Hilton, comes the Madison Beach Hotel in Madison Connecticut. 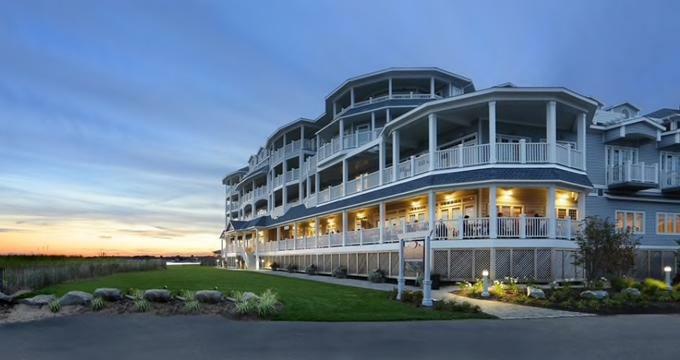 Sitting on the picturesque Connecticut shoreline, this hotel is rated as AAA Four Diamond. It has its secluded beach, multiple dining options like The Porch and the award-winning Wharf, a 24-hour fitness center, and the Sounds of the Sea spa. Hotel guests will be met with luxury amenities, plush bed furnishings, and private balconies overlooking the Long Island Sound. All the guest rooms at the Madison Beach Hotel have been designed to offer views of the Atlantic Ocean and Long Island Sound. Hotel guests will also have their own private, furnished balcony that they can relax on while enjoying the ocean breeze. The beds are fitted with plush, comfortable linens (300 thread count), comforters, and pillows (non-allergenic feather). The rooms offer either king-sized, queen-sized, or two double sized beds. Additional rollaway beds are provided on request. Each guest room has its private bathroom, made from elegant Italian marble. The larger rooms offer a separate soak tub and rain shower, while the smaller rooms have a tub/shower combination. The hotel provides complimentary bathrobes for guests to use while visiting. Each bathroom is well lit with lighted makeup/shaving mirrors and complimentary shampoo, conditioner, and body soap. Some of the in-room amenities include large working computer desks with lamps, mini fridges, an alarm clock and MP3 player, a coffee maker with a selection of coffees and teas, and an ironing board with an iron. The most massive room available, the king bedroom with a view of the Long Island Sound - which comes in at 475 square feet, also offers hotel guests an electric fireplace. All rooms are air-conditioned with an adjustable thermostat so that hotel guests can set the place to their preference. Rooms also all come with complimentary wireless internet access, and cable channels (including complimentary HBO, CNN, and ESPN) on the 37-inch LCD flat screen televisions. Daily housekeeping services are provided (although guests can opt out by placing the “do not disturb” sign on the door), as well as providing turn down and refresh services on request. All rooms at the hotel, as well as all public areas, are non-smoking. The Madison Beach Hotel provides a variety of amenities and services for both business and personal use. Business guests to the hotel can use the audio/visual rental equipment, complimentary printing services and printers, express mail, fax machines, meeting rooms, and photocopying service. Video conferencing is available on request. Private hotel guests can make use of the hotel’s automated teller machines (ATMs), baggage storage, bar area, complimentary beverages, a fully staffed multi-lingual concierge desk, digital keys, electric service, elevators, gift shop, laundry and valet facilities, room service, and safety deposit boxes. The hotel prides itself on its accessibility to guests with all different ability levels and needs. The hotel starts by providing accessible parking and continues with offering accessible public areas, guest rooms with 32 inches of clearance, audible alerts and braille in the elevators, and available assisted listening devices. It complies with all ADA (Americans with Disabilities Act) guidelines. Service animals are always welcome. However, guests with disabilities should be aware that there is no accessible route from the public hotel entrance to the swimming pool, and the pool itself is not available. The Madison Beach Hotel provides guests with a variety of different dining experiences without needing to leave the premises. On the outside of the hotel with views of the Long Island Sound is The Porch. Heated all year round so guests can enjoy dining al fresco without having to worry about the weather, The Porch offers scenic views to go with their fresh, local menu. All dining options are available for guests. For hotel guests looking for a casual, yet elegant dining experience, there is The Wharf. With an award-winning executive chef cooking up delicious, local farm to table cuisine and views of the Long Island Sound, The Wharf is the most famous restaurant in the hotel. The menu was designed with a contemporary flair, and the restaurant serves breakfast, lunch, and dinner, as well as smaller dessert and bar bites menus. The Wharf Bar is also available for hotel guests who want to enjoy a drink or a snack without having a full, sit down meal. The bar features a variety of spirits, craft beers on draft, specialty cocktails, and wines served by the glass. There is even a special Crow’s Nest two seat high top area attached to the end of the bar, which is a throwback to the previous design of the Madison Beach Hotel. The Wine Room features one of the most distinctive and unique wine collections in the state of Connecticut. This sophisticated room, covered with walnut millwork and wine cabinets, has two separate areas for hotel guests to enjoy wine - The Big Table and The Nook. The Big Table offers hotel guests a place to enjoy wine as well as small sampling bites paired with each guest. The Nook is a more intimate space, which can fit six guests at a time. Hotel guests can also purchase a breakfast included package when booking their room. The packages include breakfast for two, which can be either healthy or decadent. There is both a fitness center and a yoga studio located in the Madison Beach Hotel. Guests can go and work hard at the fitness center any time of day. The staff at the yoga studio provides yoga instruction, in both class and private settings, either in the studio or out at the beach. Guests looking to reserve a place should contact the front desk to schedule. The Sounds of the Sea spa at the Madison Beach Hotel on the third floor, provides both hotel guests and outside guests the opportunity to relax and unwind. The experienced spa therapists offer individual consultations and services seven days a week. Guests can choose from the Soothing Waves relaxation, the Deep Sea therapeutic, sports, hot stone, motherhood prenatal (provided the guests is out of her first trimester of pregnancy), and couples massages. There are also four different facials - the Hydra Blue energizing, Sounds of the Sea Signature, Citylife Brightening, and even a Whiskey facial. Three body treatments are also available - the Long Island Sound Scrub with brown sugar, Detoxifying Mud Wrap, and Bourbon Body Bubbler Scrub. While guests are not required to make reservations, because of the limited number of spaces available, and the traffic the hotel's features receive, they are highly encouraged. Spa getaway packages are available, which provides hotel guests with a spa credit that they can use toward any treatment or service, as well as a beverage and food credit. The Madison Beach Hotel has an attended beach just outside its doors. Hotel guests get beach towels, chairs, and umbrellas. When the weather is warmer, the hotel offers live music, movies under the stars, and firepits to make smores. Guests can also have a variety of beverage, lunch, and bar menu options delivered right to them when the weather permits. Also, during the summer, frozen fruit and cold lavender facial cloths are provided daily. Visitors are welcome to explore the many attractions located near the Madison Beach Hotel. Guests can visit the Long Island Sound or the RJ Julia booksellers (independently owned and operated), as well as an outlet shopping area, and multiple downtown Madison specialty stores including boutiques and antique shops. If the coastline at the hotel is not enough, the Hammonasset Beach State Park is located a few miles away and has miles of Atlantic Ocean coastline. Also, nearby is the Meigs Point Nature Center and a few other state parks. Hotel guests can also visit the Chamard Vineyard, which is a farm, winery, and bistro. The vineyard features a tasting room, special events, and a French-inspired menu in their dining area. Nearby is also the Bishop’s Orchard Farm Market and Winery. Bishop’s allows guests to pick their strawberries, blueberries, peaches, raspberries, pears, apples, and pumpkins. They also offer tastings and give tours daily. Located a few steps from the hotel is the Madison Country Club. The course is 18 holes with four different teeing options that range from 5005 to 6520 yards at the tips. It was established in the 1900s by now famous golf course architect, Willie Park, Junior. It is well maintained and open to members of the public as of 2014.